Search Appearance Pop Up - A Great Hint to Properly Optimize Your Website! Google recently unveiled a new pop up window named "Search appearance Pop Up" which can be seen beside search appearance tab after clicking the question mark icon. This new pop up was added after the recent reorganization of the left navigation menu in Google Webmasters Tools. This was announced in Google Webmasters Blog. The Search Appearance pop up menu although added as a resource for newbie webmasters to learn the essentials of how Google search works and allows them to organize their website in a manner that can be easier for Google to identify and present in the search results, can be a great signal for search engine optimizers to allow them to properly optimize the website. The search appearance pop up windows discusses the elements of Google search results. These elements make up the entire search engine result page of Google and properly optimizing each and every element discussed in the pop up as per the requirement of the website can be extremely helpful in getting good search engine visibility. Let us discuss each of the elements discussed in the search appearance pop up window. As displayed in the image above, the important elements are title, snippet, sitelinks, search within a site, url, rich snippets, breadcrumbs and author information. Title - Title is the most important element in a web page. A title should be informative and relevant. Snippet - An accurate and clickworthy summary of the page should be presented here. This is what you call as page description. Sitelinks - These are generated automatically depending on the user's query. For example, if the user is searching the site with the brand name then sitelinks gets displayed in the search results (not in all cases). In general, sitelinks gets displayed more often for popular sites. Url structure - The Url structure of your site should be logical and must provide an accurate presentation of the content present in the web page. For example a web page focussing on "Birthday Cakes" should have the url "example.com/birthday-cakes.html" or "example.com/birthday-cakes.php" or etc. Event Markup - Use markup like Data highlighter whenever you want to display event related data from the web page on the search results. This can drastically improve the search performance of a web page. Rich Snippets - Follow rich snippets data markup in order to display user ratings and reviews of the products contained in the web page on the Google search results. 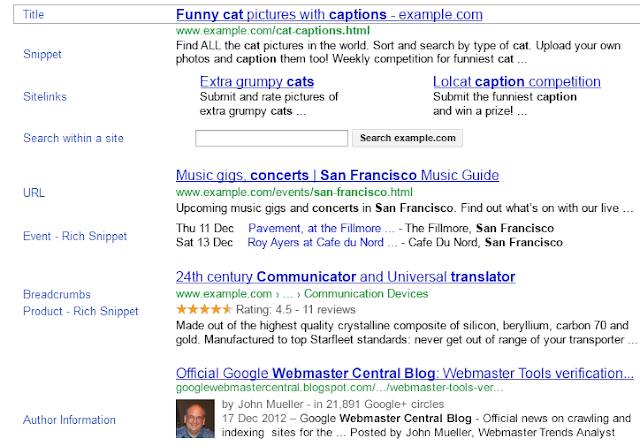 Author Information - Use Google Authorship to display author related data in the search results. This will help to move from an anonymous presentation of data to genuine ownership of data. A great ranking signal for Google based on author rank. These are the major chunks of on page optimization which must be taken care of seriously in order to get improved visibility on Google. How to Properly Use rel=Canonical?